U.S. Route 51 is a major south-north United States highway that extends 1,277 miles (2,055 km) from the western suburbs of New Orleans, Louisiana, to within 150 feet (46 m) of the Wisconsin– Michigan state line. Much of the highway in Illinois and southern Wisconsin runs parallel to or is cosigned with Interstate 39 (I-39) and much of the route in several states also parallels the Illinois Central Railroad. The highway's northern terminus is between Hurley, Wisconsin, and Ironwood, Michigan, where it ends with a T interchange at US 2. Its southern terminus is Laplace, Louisiana, ending at US 61. In addition to singing about US 61 on his album Highway 61 Revisited, musician Bob Dylan also commemorated US 51, covering the folk song "Highway 51 Blues", earlier recorded by both Curtis Jones and Tommy McClennan, on his eponymous album Bob Dylan. The North Mississippi Allstars also paid tribute to the highway in the title track of their album 51 Phantom. In Memphis, Tennessee, all of US 51 south of South Parkway East was renamed from Bellevue Boulevard to Elvis Presley Boulevard. Graceland sits on this highway, in the subdivision of Whitehaven. Before the construction of I-55, US 51 was routed along what is now US 51 Business between Hammond and Ponchatoula. US 51 Business ends at the joined I-55/US 51 south of Ponchatoula. From this point southward, while US 51 is joined with I-55, the former routing of US 51 lies at ground level just to the east of I-55/US 51 and carries no designation. While the southern terminus of US 51 is in Laplace at U.S. 61, it was once co-signed with U.S. 61 into downtown New Orleans. However, it was originally slated to head toward New Orleans along the south shore of Lake Pontchartrain via the New Orleans–Hammond Highway (old LA 33), which was never completed. US 51 enters Mississippi from Tennessee at Southaven and parallels Interstate 55 to the east for much of its length, except for the section between the Tennessee line and Grenada, where it parallels the highway to the west. From Memphis, US 51 passes through Senatobia, Batesville, Grenada, Winona and Canton before reaching Jackson. At the Jackson- Ridgeland line, US 51 overlaps I-55 from Exit 103 (County Line Road) to Exit 96A (Pearl Street) downtown. The split is only temporary as the highway traverses Pearl, Pascagoula and State streets and meets I-55 again at Exit 93 ( Interstate 20/I-55/State Street interchange). The Natchez Trace Parkway is crossed near Clinton. The two highways run together until Exit 72 (North Crystal Springs). The highway then parallels the interstate through Hazlehurst, Brookhaven and McComb until it reaches the Louisiana border. The Mississippi section of US 51 is defined at Mississippi Code Annotated § 65-3-3. US 51 travels through Memphis and up to the Kentucky border in the Mississippi valley. It is planned to become or be bypassed by Interstate 69 through Tennessee. U.S 51 enters Kentucky at Fulton, and continues north through the towns of Clinton, Bardwell and Wickliffe to the Ohio River, where it is multiplexed with U.S highways 60 and 62 over the Ohio. US 51 between Mounds and Cairo, during the Great Mississippi Flood of 1927. US 51 enters Illinois from Kentucky at the town of Cairo. The route heads northbound to a village near Cairo called Mounds, and begins to overlap I-57, following it for 24 miles (39 km) to Dongola, before splitting and heading north. The route remains two lanes from Dongola to just before Assumption with the exception of a 10-mile (16 km) section between Centralia and I-64. Past Assumption, US 51 becomes an expressway to Decatur. In Decatur, US 51 follows I-72 to bypass town. US 51 leaves I-72 after eight miles (13 km), and heads north to Bloomington– Normal as an expressway. At Bloomington–Normal, US 51 follows I-74 for a mile, then I-55 for seven miles (11 km), before following I-39 for 140 miles (230 km). US 51 follows I-39, intersecting I-80 and I-88 along the way. The highway also follows US 20 south of Rockford (while still following I-39). I-39/US 51 joins I-90, making US 51 of the only toll roads in Illinois that is a U.S. Highway. US 51 exits I-39/I-90 just a mile south of the Wisconsin state line. US 51 follows Illinois Route 75 (IL 75) west to the intersection of IL 251, then turns north through South Beloit to enter Wisconsin. In the state of Wisconsin, US 51 enters from Illinois at Beloit. US 51 splits off from I-39/ I-90 in South Beloit, Illinois, and continues north through Janesville and Edgerton. In Edgerton, US 51 rejoins I-39/I-90 for 3.5 miles (5.6 km) before splitting off towards Stoughton and McFarland. US 51 runs almost parallel to I-39/I-90 through the eastern portion of Madison, crosses the Interstate in DeForest, and finally rejoins I-39 again at Portage. US 51 runs concurrently with I-39 until I-39's terminus in Wausau and continues on as a mixture of freeway and expressway until just north of the interchange with US 8. From there through Hazelhurst, US 51 is a two-lane road with sporadic three-lane sections (which were constructed in 2008). US 51 expands to four lanes, with a central fifth turn lane from Hazelhurst to Arbor Vitae; north of Arbor Vitae it returns to two lanes and continues to its northern terminus in Hurley, where it junctions with US 2. I‑55 northeast of LaPlace. The highways travel concurrently to Hammond. I‑55 in Crystal Springs. The highways travel concurrently to Jackson. I‑20 / US 49 in Jackson. The highways travel concurrently through the city. US 64 / US 70 / US 72 / US 79 in Memphis. US 51/US 64/US 70/US 79 travels concurrently through the city. US 412 in Dyersburg. The highways travel concurrently through the city. Future I‑69 / I‑155 / US 412 in Dyersburg. I-69/US 51 travels concurrently to southwest of Troy. US 45W northeast of Union City. The highways travel concurrently to South Fulton. Future I‑69 in Fulton. The highways travel concurrently through the city. US 62 in Bardwell. 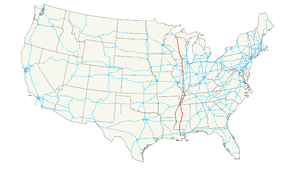 The highways travel concurrently to Cairo, Illinois. US 60 in Wickliffe. The highways travel concurrently to Cairo, Illinois. I‑57 in Cairo. The highways travel concurrently to near Dongola. US 50 in Sandoval. The highways travel concurrently through the village. US 40 in Vandalia Township. The highways travel concurrently to Vandalia. I‑72 in Harristown. The highways travel concurrently to Decatur. I‑74 in Bloomington Township. The highways travel concurrently to northwest of Normal. I‑55 in Bloomington. The highways travel concurrently to Normal. I‑39 / I‑55 in Normal. I-39/US 51 travels concurrently to South Beloit. US 20 in Rockford. The highways travel concurrently to Cherry Valley. I‑90 in Cherry Valley. The highways travel concurrently to South Beloit. I‑39 / I‑90 in the Town of Albion. The highways travel concurrently through the town. I‑39 in the Town of Fort Winnebago. The highways travel concurrently to the Town of Rib Mountain. US 10 in Stevens Point. The highways travel concurrently to the Town of Hull. ^ Bureau of Public Roads & American Association of State Highway Officials (November 11, 1926). United States System of Highways Adopted for Uniform Marking by the American Association of State Highway Officials (Map). 1:7,000,000. Washington, DC: United States Geological Survey. OCLC 32889555. Retrieved December 6, 2016 – via University of North Texas Libraries. ^ "U.S. Route Number Database". American Association of State Highway and Transportation Officials. December 2009. Retrieved December 6, 2016. ^ "Explore Highway 51 Coalition". Archived from the original on April 8, 2014. Retrieved October 9, 2014.